Many people don't know that cardiac arrest is one of the leading causes of death in the U.S. - a frightening fact, but true. *Cardiac arrest is just a fancy way of saying that someone's heart has suddenly lost its function - not to be confused with a heart attack - two different things! Of the people who suffer cardiac arrest outside of a hospital, the majority DO NOT receive CPR from a bystander, which contributes to their low chances of survival. What a world of difference it would make if more people knew how to properly perform CPR! Lives would be changed - in fact, lives would be SAVED. The good news is that CPR is easy to learn. Our company, Learn CPR 4 Life, empowers thousands of individuals with proper training each year. And today we want to share some of the reasons why it's so beneficial to learn CPR. Follow along with us. 1. We've already touched on the number one reason to get certified - CPR skills can SAVE LIVES. According to the American Heart Association, more than 300,000 cardiac arrests occur in the U.S. each year. Sudden heart failure can lead to someone collapsing, having difficulty breathing, poor blood circulation, or losing consciousness. Without blood properly circulating, the chance of survival plummets. By performing CPR quickly, a person's survival rate more than doubles. Worth it? We think so. 2. According to national studies, only 15-30% of people who suffered a cardiac arrest outside a hospital were given CPR by a bystander. During research, people were asked "what stops you from performing CPR?" A common answer was that the person simply did not know how, or that they feared they would do more harm than good. Because of a lack of training, CPR is not performed enough. Imagine the difference it would make if more people knew proper techniques and felt confident in administering CPR. 3. Another reason why people do not feel comfortable performing CPR is attributed to the common misconception that mouth-to-mouth resuscitation must be performed. Fortunately, in 2010, CPR guidelines were changed to say that if someone is not comfortable performing mouth-to-mouth, it's best to implement only hands-to-chest resuscitation. In fact, hands-only CPR proves to be just as effective as other methods for adults who experience sudden cardiac arrest. 4. 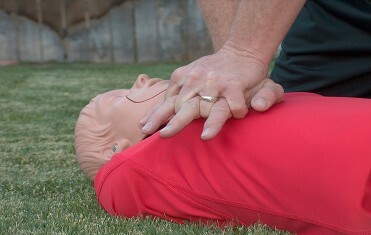 Hands-to-chest CPR is easy to learn. Watch this funny video to see a quick tutorial. If you want to get certified, check out our class schedule, or call us at 760-947-2426. 5. Many hospital patients have reported that their sibling, spouse, or parent saved their life with CPR. Since nearly 80% of cardiac arrests occur at home, it's so important to learn the life saving skill of CPR. We invite you to take the CPR challenge: If you haven't already - learn CPR and build confidence knowing that you could save a life!